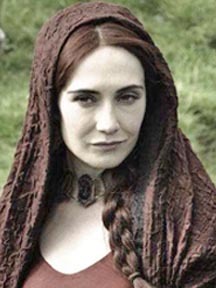 Every time I tune into Game of Thrones, I’m struck by a few things, the sheer brutal, barbaric nature of it, the brilliant conniving manipulative characters and…the jewelry! The show takes place in a fantasy world with no direct correlation to any one particular time in history. Instead it is more of an amalgam of elements from different periods. George R.R. 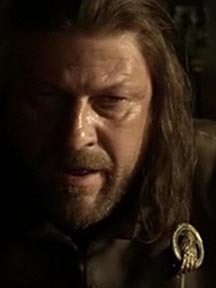 Martin, author of A Song of Ice and Fire, on which Game of Thrones is based, has admitted to reading everything he can find about medieval history. 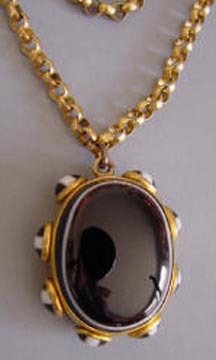 However, along with Medeival influences, there are also Victorian and Gothic touches in the costumes and jewelry. 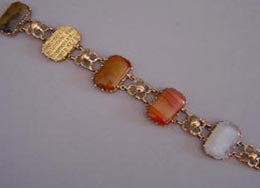 One particular style of Victorian jewelry that seems very Game of Thrones to me is, Scottish Agate jewelry. “Gothic and Celtic Revivals were already well under way when Queen Victoria ascended the throne. Her own romantic attachment to ancient and medieval history was certainly influential in furthering the public’s preoccupation of the past. In 1848, after Queen Victoria purchased Balmoral , a castle in Scotland, everyone became enamored of Scottish motifs. 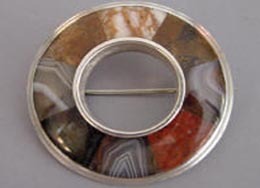 Circular Scottish plaid pins, heraldic crests, dirks and claymores (knives and swords), thistles and St. Andrew’s crosses (Scottish national emblems), were all made into jewelry.” (1) These jewels we’re most often set with opaque stones in earth tone colors, such as red and orange jasper, bloodstone, striped agate, malachite, as well as citrine and amethyst.